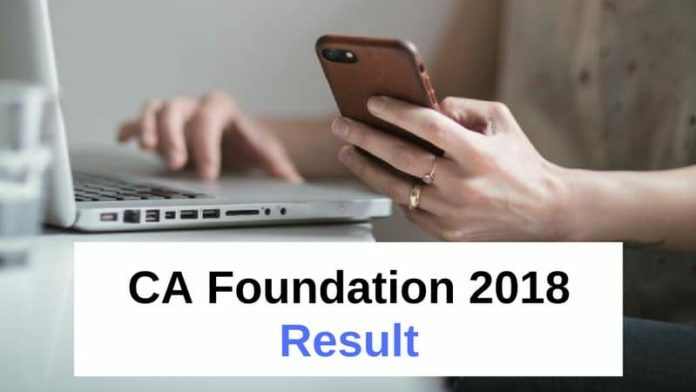 CA Foundation Result 2018 – The ICAI has announced the CA Foundation Nov Result 2018. 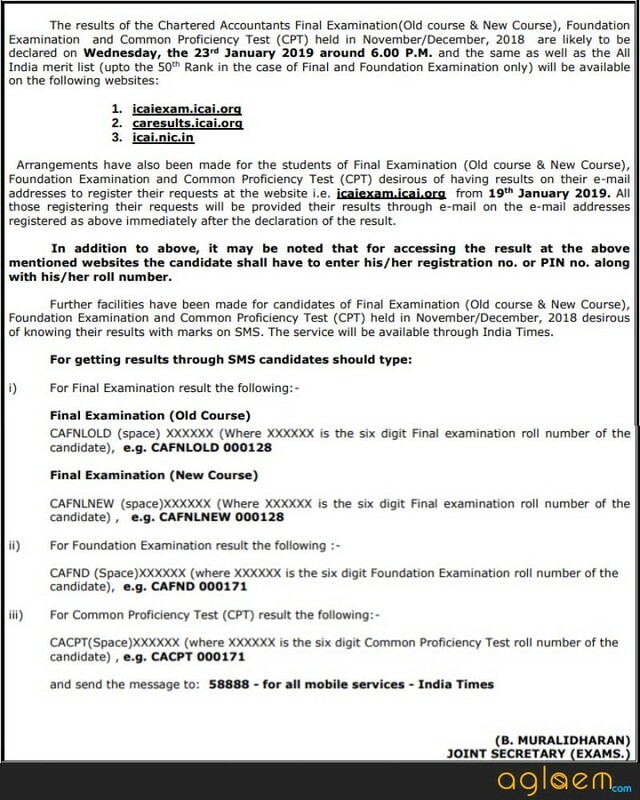 The candidates can check the result for CA Foundation Result from the official website, icaiexam.icai.org. The candidates can also get their result through email id and sms and e-mail. The score, as well as the merit of the candidates has been released. Soon after the declaration of CA Foundation Result Nov 2018, the Statement of Marks will be issued. 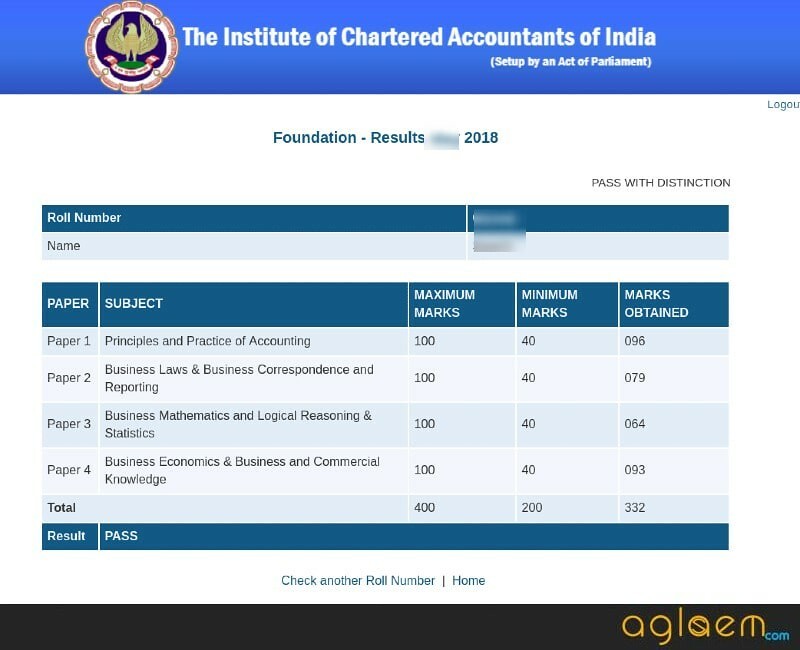 Check here complete details about the CA Foundation 2018 Result from this page. A candidate after passing the Foundation Exam will be eligible to register himself/herself for Intermediate Course. The candidates can check the complete schedule for CA Foundation Result Nov 2018 from the table below. Click Here to check CA Foundation 2018 Result. Prit Protest Shah, from Surat, has topped CA Foundation with 67.75%. The top 3 candidates are as follow, and we congratulate you all. 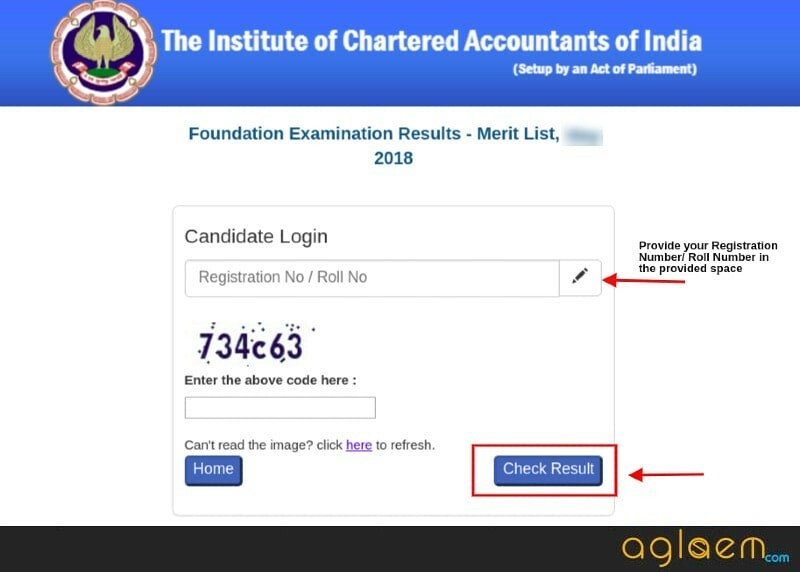 How to Check CA Foundation 2018 Result? Click on the direct link available on this page as per the schedule. Next, log in by entering your Roll Number and Pin Number or Registration Number. In order to be declared as qualified, the candidates need to obtain 40 marks in each paper and a minimum of 50% marks in aggregate of all the 4 papers, in one sitting. Click on the direct link which is going to be provided on this page to check the merit list. On the login page, enter your Registration Number/ Roll Number. On submitting the details, the candidates can check the Top candidates in merit list up to 50th rank. The toppers for CA Foundation Nov 2018 exam will be available soon after the declaration of result. 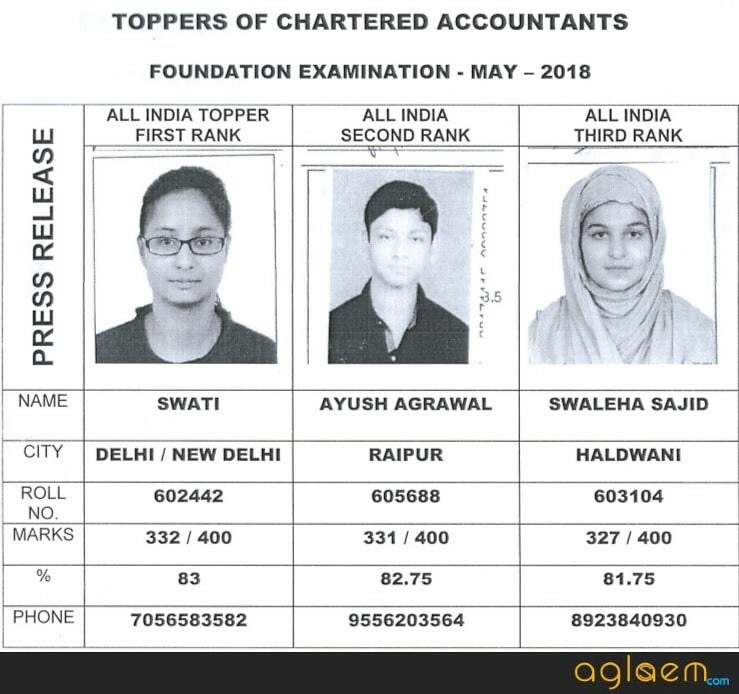 In the CA Foundation exam for June 2018, Swati, Ayush Aggarwal and Swaleha Sajid were the top three rank holders with AIR 1, AIR 2 and AIR 3, respectively. The first and second position has been bagged by girls. 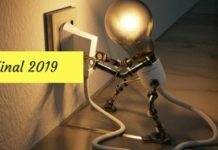 What after CA Foundation 2018 Result is Declared? After the declaration of the result, the candidates will get the Statement of Marks and Rank Certificate. No pass certificate is issued to the candidates by ICAI. Rank Certificate – A rank certificate is issued to only those candidates who have secured a minimum of 60 per cent marks in aggregate. The Rank certificates are issued upto 50th rank, on All-India basis. The Rank certificates are distributed to the First, Second and Third rank holder. Those candidates who will secure a place in the top 50 (All India category) will only get the Rank certificate. 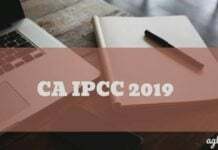 The top three Rank holders will be invited to the Annual Day function of the Institute held at New Delhi, generally in the month of February 2019 where they will receive their rank certificates from the President, ICAI. Other rank holders until the 50th rank, will get their rank certificates via post at their registered address. All the candidates who will pass the examination will get a statement of marks via post. In case you do not receive the same, for any reason, within 4-5 weeks from the date of declaration of results, you may write to [email protected]. 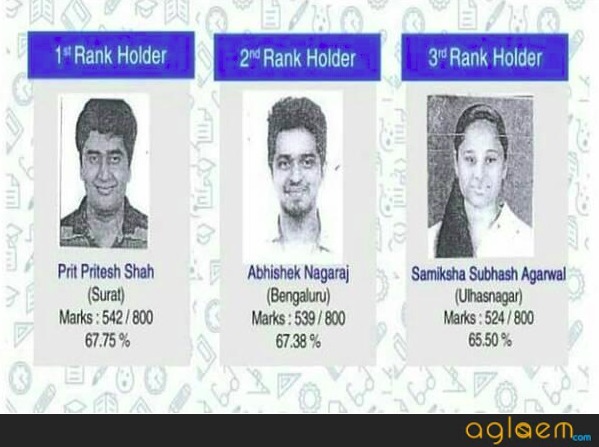 A Candidate will be declared to have passed the Foundation Examination if he secures a minimum of 40 marks in each paper and a minimum of 50% marks in aggregate of all the 4 papers, in one sitting. Pass with distinction: This Status is given to those candidates who secure a minimum of 70% marks. Apply online after the declaration of the result at the official website of ICAI. You have to also pay a fee of Rs. 500/- per paper. The application is to be made within 30 days from the date of declaration of result. Scanned copies of evaluated answer books will be available on the website. 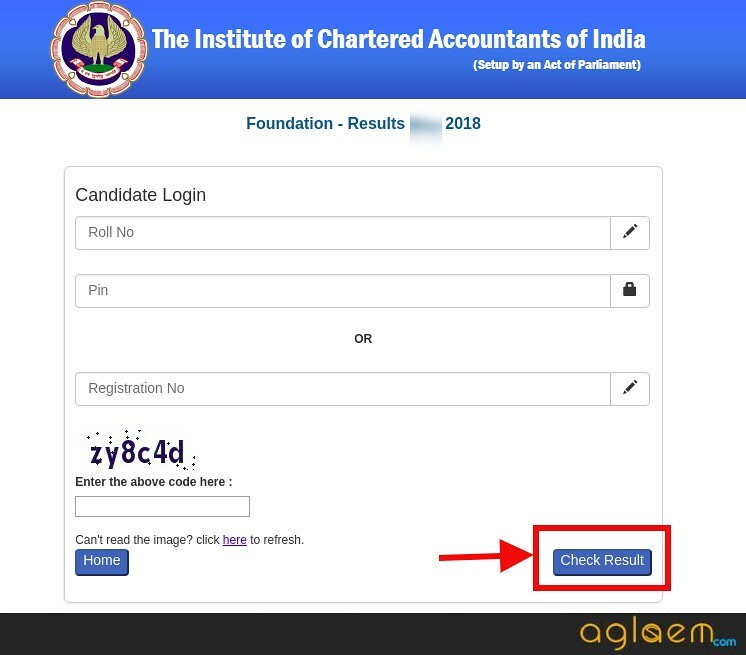 The candidates can check their result by Online mode or can get their CA Foundation Result 2018 by registering their request at the official website. 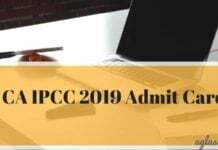 The link for submitting the request is going to start from January 19, 2019, onwards. Click on the link on this page or visit the official website of ICAI. On the homepage of the website, click on the Login/Register tab. Then, enter CA Foundation registered user id and password to login in ICAI registered account. CAFND (Space)XXXXXX (where XXXXXX is the six digit Foundation Examination roll number of the candidate), e.g. CAFND 000171 – and send the message to 58888 – for all mobile services. More than 2or 3 students can receive the same rank or 1 student with one rank only ??? there must be some difference in their scores from that they will be ranked.